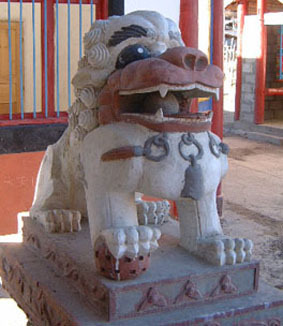 These guardian lions are somewhat different from the run-of-the-mill stone lion found in China. 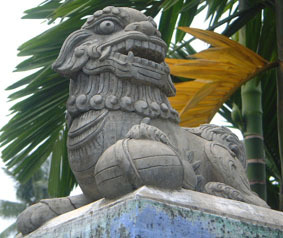 They include lions outside a Tibetan temple, some whimsical-looking lions from Hue, Vietnam, and a Ming-dynasty lion. These lions outside a Tibetan temple on the way to Jiuzhaigou, Sichuan province, appear to be made of wood and are painted. The male and female are clearly distinguished in the conventional manner, with the male holding down a ball and the female holding down a cub. Two rather idiosyncratic stone lions in Hue, Vietnam. 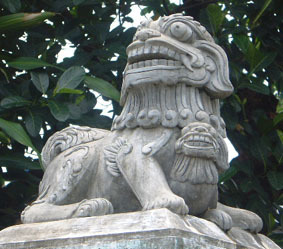 The lions were on top of gateposts at the entrance of a well-to-do residence. 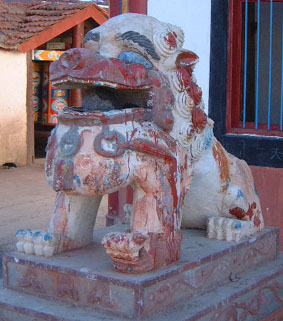 This Ming dynasty stone lion once stood outside the ancient Daoist temple in Lecheng, Qionghai, Hainan. This is the sole survivor of the pair. Ming dynasty lions are quite different from later lions because (1) they don't look like lions, (2) they don't look ferocious, and (3) there is no differentiation into male and female lions. To my regret, I failed to photograph a fine pair of Ming lions, looking somewhat similar to this one, at Zumiao in Foshan, Guangdong Province.